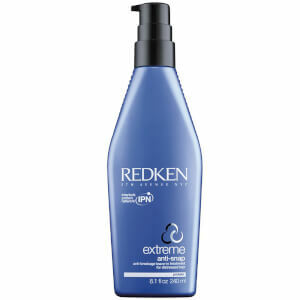 This fantastic Redken Extreme +1 Pack resurfaces and strengthens your distressed hair. 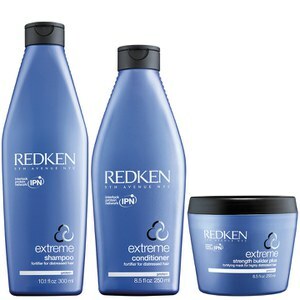 Redken’s exclusive Interbond Conditioning System delivers a unique 3D Repair Complex to fortify your hair so it looks and feels healthier with increased manageability and shine. It can make your hair up to four times stronger. Gently cleanse and repair your excessively dry, brittle and damaged hair. This fantastic, nourishing shampoo will leave it supple and really manageable. This creamy conditioner revitalises and detangles your damaged hair, it smoothes cuticles and eases wet combing. This great intensive treatment instantly replenishes the ideal moisture levels in your hair and nourishes it with proteins and ceramide to leave your locks super soft and ultra shiny.